In June, WizKids announced a partnership with Nickelodeon to bring Nickelodeon's beloved Teenage Mutant Ninja Turtles to WizKids' tabletop games. As part of the agreement, new Teenage Mutant Ninja Turtles HeroClix and Dice Masters games will be arriving in stores later this year, giving gamers twice the Teenage Mutant Ninja Turtles-themed gaming and collectability. So what's in store for gamers when Teenage Mutant Ninja Turtles HeroClix hits shelves? The first waves of Teenage Mutant Ninja Turtles HeroClix collectible figure releases will have 35 figures distributed through 24-count, single-figure foil pack gravity feed displays that will include classic and fan-favorite characters including Leonardo, Michelangelo, Raphael, Donatello, Shredder, and more. The figures themselves will be based on the original comic book designs, which means long-time fans will definitely want to collect the original red-masked versions of the Turtles. 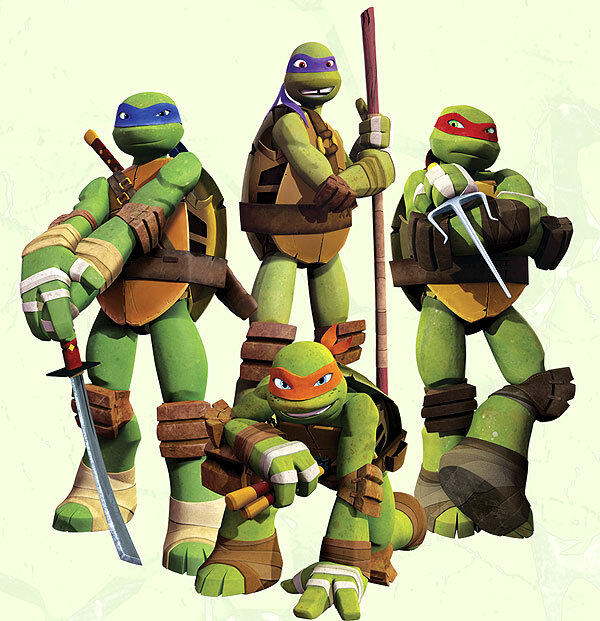 In addition to finding characters coming from the original Mirage run of the comics, fans can expect to find versions of the characters from the 1987 cartoon as well as the current and popular Teenage Mutant Ninja Turtles animated series available on Nickelodeon. “We’re extremely excited to be working with Nickelodeon on Teenage Mutant Ninja Turtles,” said Brian Roll, Senior Art Director, WizKids. “It’s been a dream license for us and to finally be able to work on the Turtles is almost surreal. We look forward to going deep into the history of Teenage Mutant Ninja Turtles and bringing a vast and varied collection of characters to the table." 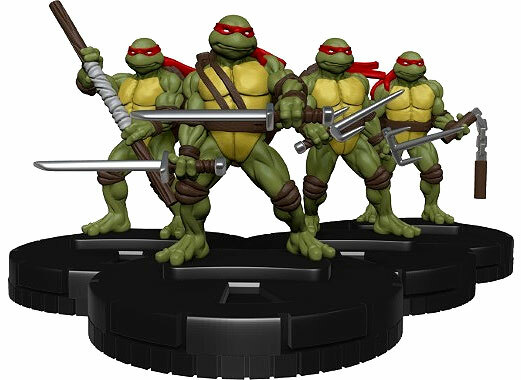 As the Teenage Mutant Ninja Turtles HeroClix sets will be based on the well-known HeroClix rules and Combat Dial technology, players will be able to easily integrate Leonardo, Michelangelo, Raphael, and Donatello with other HeroClix sets, thus making for some great cross-universe battles with classic superheroes and villains. In addition to the single-figure booster set, players can look out for a new Starter Set format, which will include all the materials needed to play the contents for standard HeroClix play, as well as special rules and gameplay material to support multiple different scenario games for anywhere between 1-5 players. Fans and players alike can also look forward to a Teenage Mutant Ninja Turtles Fast Forces Pack and Teenage Mutant Ninja Turtles Dice & Token Pack. Moreover, there will be an Organized Play Kit for Teenage Mutant Ninja Turtles HeroClix, so fans and players can keep a look out for these special events at their friendly local game store for a chance to win exclusive prizes! For Dice Masters players, the Turtles will also be making an appearance in their own custom sets designed by Mike Elliott and Eric M. Lang. While it's too early to say exactly what specific custom dice will be available, the classic characters from Teenage Mutant Ninja Turtles will certainly be part of the product line. Just like other Dice Masters releases, players will be able to play as heroes, villains, or any other unique combination they devise. As with the Teenage Mutant Ninja Turtles HeroClix products, the Teenage Mutant Ninja Turtles Dice Masters games will be fully integrated into the current Dice Masters lineup, meaning your favorite Turtles can jump into combat with (or against!) other superheroes from various comic book and movie universes. The initial release plans include a tin and box set, each containing a fixed set of cards and dice that will give players, new and old alike, an experience worth reliving over pizza. Players attending WizKids’ World Championships event this past June at Origins Game Fair were especially excited for Teenage Mutant Ninja Turtles to become a part of the games they already know and love. Many of them are eager to bring Teenage Mutant Ninja Turtles characters as part of their next championship team! Can’t wait to get your hands on your very own Teenage Mutant Ninja Turtles HeroClix or Teenage Mutant Ninja Turtles Dice Masters sets? Then make sure to keep a look out at your local game or hobby store for future information and availability. Also, visit HeroClix.com and DiceMasters.com for the latest product information. 35 characters for DM would be AMAZING. I'd be super happy with that. EDIT: Also, DWD would be amazing too. Somebody make some custom DWD.
. It would really be interesting how they manage it. But it is obvious they will make the weapons as symbols for the 4 of them. I guess they will maybe make the dice not green but as the colour of masks and not like i think it will be. And be aware for a while now there was no new Episode from the Turtles. Maybe the release will also come with a good continue of season 3 and going into a final episodes to encounter shredder and krang. And i love they take the series. It is not the old days with the comics or the Cartoon series from this time, because it is not only us who are old enough to know the first turtles and what came after it. There are plenty of young people who maybe will encounter this Set and maybe es entry in DM as well, and the series from 2012 and the Movie from MichaelBayplosion. Who do you think will be in the Set? The person with the most right Cards will win a Turtle-Soup without Turtles(so just soup) ! BadGuys(17):Shredder,Rocksteady,Bepop, KrangSoldier, KrangPrime,TigerClaw,Newtralizer,BaxterStockman,Fo otClan Soldier,Rahzar,Purple DragonGuys,Squirrelanoids,Granitor,Ratking,Plant Mutant. Last edited by Ressless; 08-01-2015 at 05:17 PM. "The initial release plans include a tin and box set, each containing a fixed set of cards and dice that will give players, new and old alike, an experience worth reliving over pizza"
Wonder if that means there will be further releases? I suspect it means "This is what we're planning right now, but if this ends up being wildly popular we reserve the right to come out with more stuff later." Bare minimum I'd guess is that the tin is limited to the initial run, with any future printings in just the regular box. Full future sets, or larger booster sets would be awesome. Are the box and tin going to have different cards? And supposedly the Team Box comes with cards now as well...I wonder if those will be different. I suspect that the contents of the standard box and tin will be identical. I also suspect that the box will be a Collectors Box and the Tin will be like the old Quarriors Tin. Additionally, I suspect the cards and dice that will come with the Team Box will be special Sidekick and Basic Action dice, along with a copy of each of the Basic Action cards, the Colour Indicator cards, and one or more Full-Art variant cards (I have a sneaky suspicion we'll see one of each Turtle). I have heard repeatedly that they have access to the art and images of the entire span of turtle history. If that's the case, I'm hoping that they chose to do a non-collectable format so they could release different art for each copy of the 4 turtles. Donatello - the scientist versus Donatello - Bo Staff would have maybe original Black and white art for one of them and Animated Series art for another. The better this sells, the more likely a second set is. So if you like this, and want a second set, maybe get the team box and a dice bag or two. Vote with your money, it's the language that companies always understand. So I guess you're thinking the team box is the new "Collector's Box"? For this set (and any other non-collectible sets they might do). I think they will still keep the Collectors Box and Team Box as they are currently for the collectible sets. I really hope this is the new normal. Buy a team box, there's an alt art card in there. Currently, I don't want collectors boxes. The starters have what I need in them. I buy a a team box every time they come out. Putting special stuff in the team boxes would be excellent. I'm buying a tin, a box, 2 bags, and a mat. Ninja got to stick together. Also, Hopefully my son will stay out of mine now. LOL.